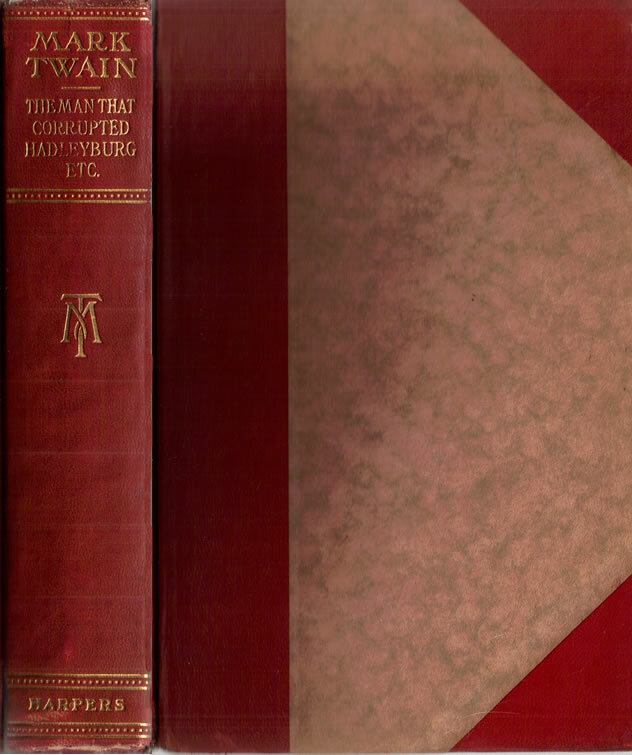 Harper and Brother's began advertising Mark Twain's Author's National Edition in red half leather binding in the fall of 1917 and the sales campaign continued into the spring of 1919. The ads are found at the bottom of much larger ads for the green cloth Author's National Edition. Large ad from The New York Times, September 16, 1917. The red leather binding option was featured in small print in the lower right hand corner of the coupon. Close up detail of the ad for the red half leather binding. The red half leather binding featured trimmed pages, gilt top edges, gold stamped titles, MT monogram on the spine and marbled board covers. The red half leather binding was offered in 1917 at a time when Harper was in the midst of removing the word "all" from the authorized Uniform Edition statements. Some volumes bound in red half leather have been found with both versions of the statement -- an indication that Harper was using left over printing sheets as they put together the volumes. Both versions of this statement have been found in the red half leather editions issued in 1917. As World War I intensified, the advertising copy for the Mark Twain ads featured a patriot them. The following ad which includes an offer for the red half leather binding features a scene that never appeared in any of Mark Twain's works. Ad from Review of Reviews July 1918 featured an illustration by artist De Alton Valentine (b. 1889 - d. 1936) who drew Tom Sawyer drowning an unpatriotic American. 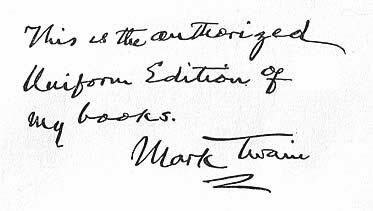 No such storyline is found in Mark Twain's works. In September 1918 Harper decreased the amount of time from 20 to 15 months in which a buyer could pay off the debt for a set of the Author's National Edition bound in red half leather Although the overall price remained the same, a buyer would be required to pay $4 a month for 15 months. Ad from The Independent, September 21, 1918 indicating a higher monthly payment of $4 over a period of 15 months for the red half leather binding. 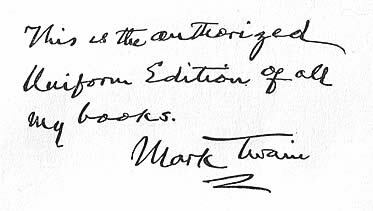 By the Fall of 1919, Harper and Brothers and ceased advertising the red half leather binding of the Author's National Edition of Mark Twain's works. In January 1920, a much more expensive set bound in black leather was being advertised. Content is consistent with Author's National Editions green cloth sets issued in 1917.